Single Line Injector Type Lubrication System that we offer is manufactured under the guidance of experts by following the set industry standards. We conduct stringent quality tests on Lubrication System so as to ensure that only the defect-free product reaches the customers’ end. We are listed among the top Manufacturers and Suppliers of Lubrication System. 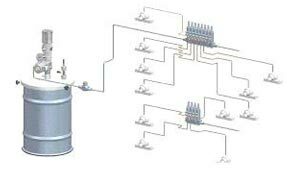 Buyers prefer to buy Lubrication System from us as we make it available at a very reasonable price. 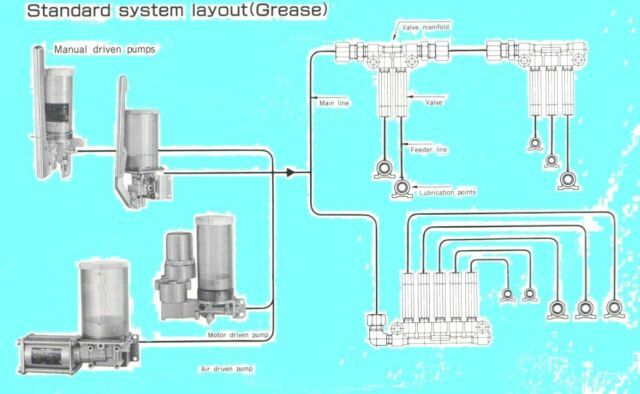 Principle of operation : Single main line runs from the pump to the farthest metering valve or injector directly or in branches. Lubricant output from pump reaches each metering valve or injector directly from main line. Pressure and flow from pump forces spring loaded pump in the valve to move, dispensing metered quantity of lubricant from measuring chamber to bearings. After all the injectors are operated, further increase in pressure stalls pump and pressure switch it provided sends signal. Then venting cycle starts by reliving the pressurised main branch line and thus makes all the injectors ready for next cycle. Glass forming machines, Tyre tube curing presses, Hydraulic Presses, Food processing & Packaging machines, Textile machies and Earthmoving equipments.